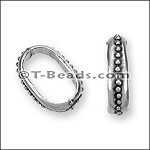 The daisy tube bead is 20.8 x 12.6mm and designed to fit the Regaliz leather. It is lead free and nickel free. I love this Daisy Tube. 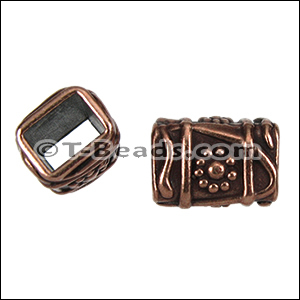 I got it in Copper and Silver and made the silver on black leather with two smaller sliders with O rings. It turned out beautiful and my friend I made it for loved it. 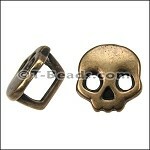 I love the detail and quality of this charm. 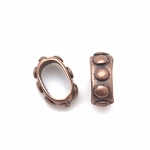 It's quite versatile and it looks great on leather alone or with other components.